Somali government forces secure the scene of an explosion in KM4 street in the Hodan district of Mogadishu, Somalia October 15, 2017. MOGADISHU - At least 263 people were killed by twin bomb explosions in the heart of Somalia’s capital Mogadishu, doctors said on Monday, confirming the deadliest attacks since an Islamist insurgency began in 2007. Local officials had put the death toll at over 200 on Sunday without giving a firm number following the blasts that struck two busy junctions on Saturday. 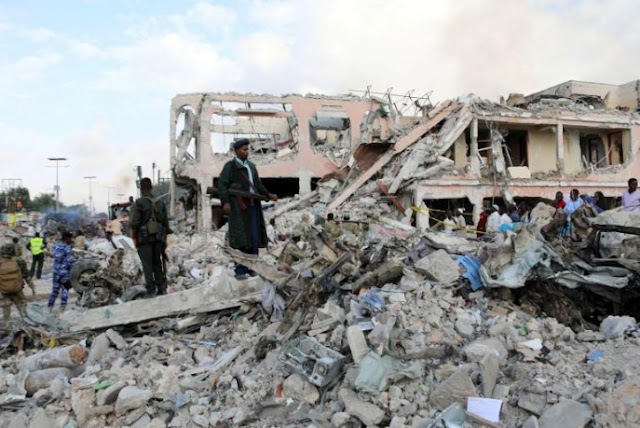 Aden Nur, a doctor at the city’s Madina hospital, said they had recorded 258 deaths while Ahmed Ali, a nurse at the nearby Osman Fiqi hospital, told Reuters five bodies had been sent there. “160 of the bodies could not be recognized and so they were buried by the government yesterday. The others were buried by their relatives. Over a hundred injured were also brought here,” Nur told Reuters at the hospital. Eight of the serious injuries were moved by ambulance to the airport on Monday morning to be flown to Turkey for further treatment, Nur added. At least 263 people were killed by twin bomb explosions in the heart of Somalia’s capital Mogadishu, doctors said on Monday, confirming the deadliest attacks since an Islamist insurgency began in 2007.